Would you like a little something that would help you stand out from your competitors? Something that gets you noticed? Something that just might give you a distinct edge? Something simple, different and easy to implement that costs just pennies? Last month’s article Part 1 – On That Note: Effective Marketing on a Shoestring shared “Why” handwritten notes are effective even in today’s digital world of communication. This month we’ll share five simple ways on “How” to use a handwritten note. Here’s another tip. 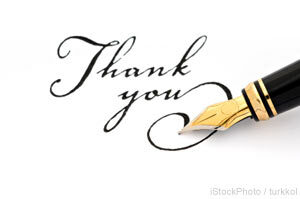 How many times have you received a thank you note just because you made an inquiry or asked for a quote? Right – NEVER! Send a personal note to say thank you when a prospective client does just that. Your prospect may be surprised and flattered by the gesture but the end result is that they tend to take a closer look at your proposal or quote. Even if you don’t get this contract, you plant the seeds of goodwill for the NEXT one. Send notes to congratulate your customers and business associates when they have an achievement, promotion, a memorable event or they are changing jobs. Use a postcard to say “Hi” and stay in touch. For the same reason we don’t write notes, we have clients who we haven’t spoken to in a while. (Where does the time go?) It doesn’t need to be custom printed with your logo and smiling face – use the ones you find in the drugstore. Choose a picture that reflects your city, or might remind your client of you. Cheap and cheerful! Attach a handwritten note to an article that you found in a CURRENT newspaper, trade magazine, or newsletter. Send it to your client with a note that says, “Elizabeth, I thought of you when I saw this article and thought you might enjoy it.” This personal touch can be far more effective than sending ANOTHER product brochure! 5. And if you really need an excuse . . .
Notes can be the ‘tipping point’ that enables you to stand out in the crowd. In this highly competitive world of business, The note you send today could possibly give you new business tomorrow. im interested in knowing more about it. What would you like to know specifically? I hope that you read Part I of this article as it has some great ideas and tips on the why’s and how’s.